As Summer Vaca winds down & the temps cool a little we're left in this weird limbo between Summer & Fall. It's definitely not the time for spaghetti straps but also not the time for a thick sweater, so what do we wear to work!? I love wearing a light chambray material during this weather as it keeps me cool but doesn't leave me looking like I'm under dressed. 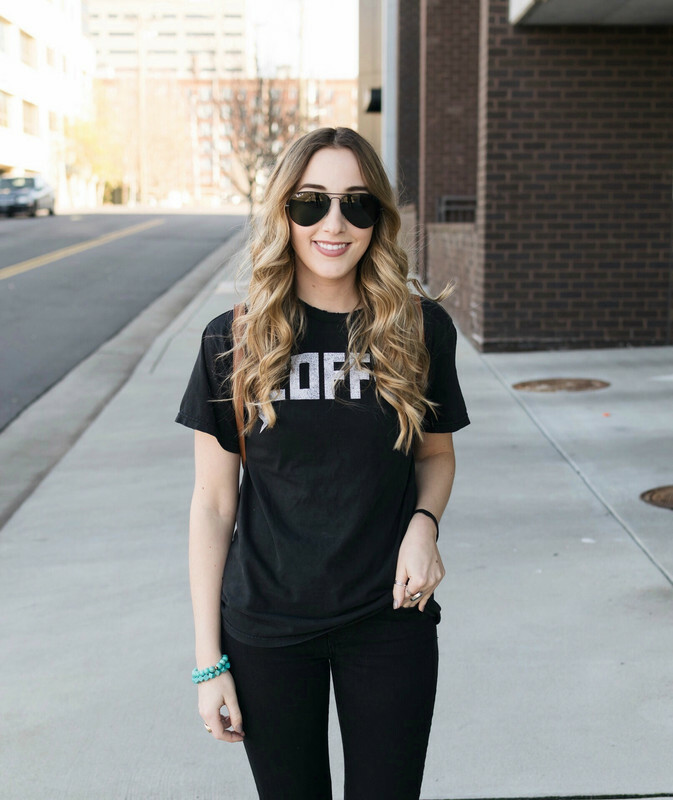 Pairing this type of top with white jeans will also help to make this look transition from the heat of summer to the cooler fall temps. I paired this look with some mule sandals, these are the perfect transitional piece to add to your wardrobe. Your feet are covered for the most part but you get a little glimpse of your fresh pedi, think of them as a mix between a closed bootie & a wedge sandal (perfect!). 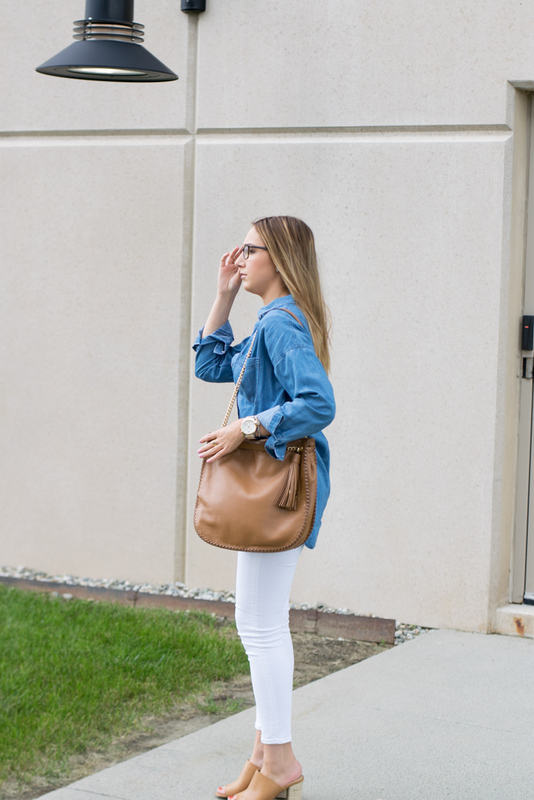 I threw on my favorite pebbled leather bag with this look & was ready to head to work! What do you like to wear to work in the summer? This really is a perfect work look! I wear outfits like this a ton in the spring and summer to school - you're right, it's so great for the weather! 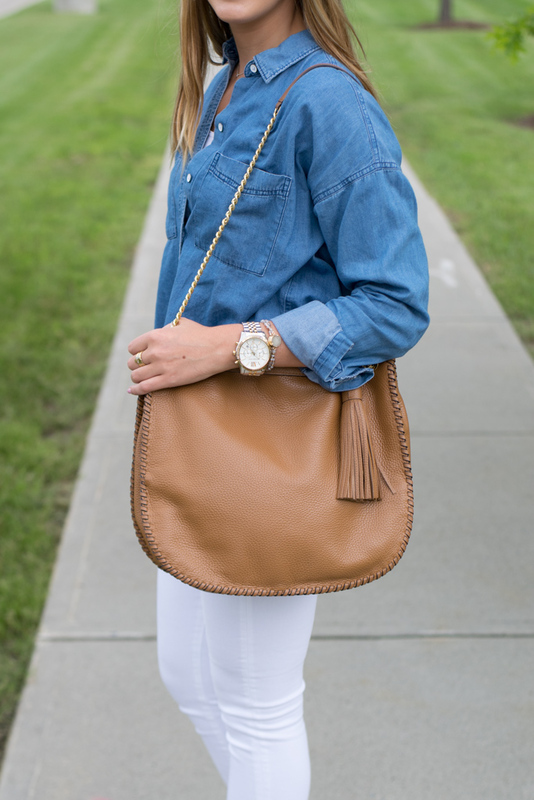 Love this look - it's perfect for summer! Such a great summer look so cute. This look is so cute! I really love your bag and shoes! Love this outfit - especially the shoes!! 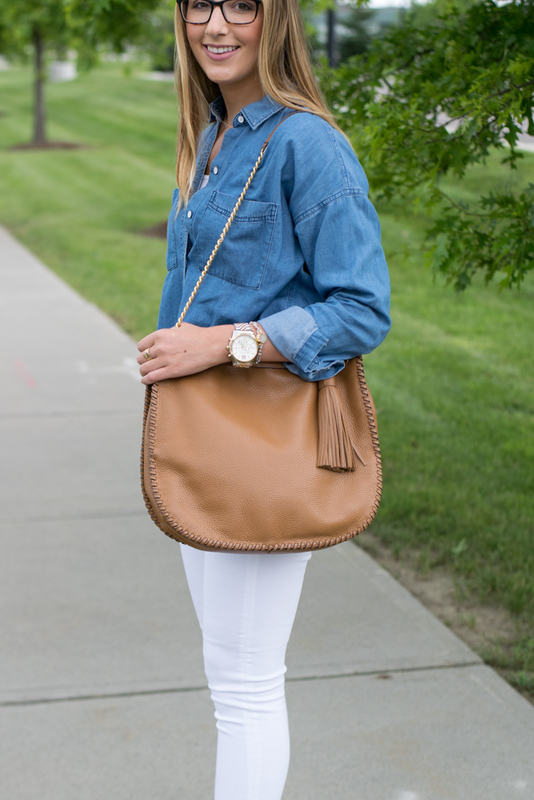 I would definitely wear an outfit like this to work this summer! How cute! Such a classic work outfit! Love it! Love the look! It's still going to be hot as heck here in Louisiana for a while, but I'll def keep this in min when it finally cools off! Very cute summer look! Absolutely perfect for work! So cute! 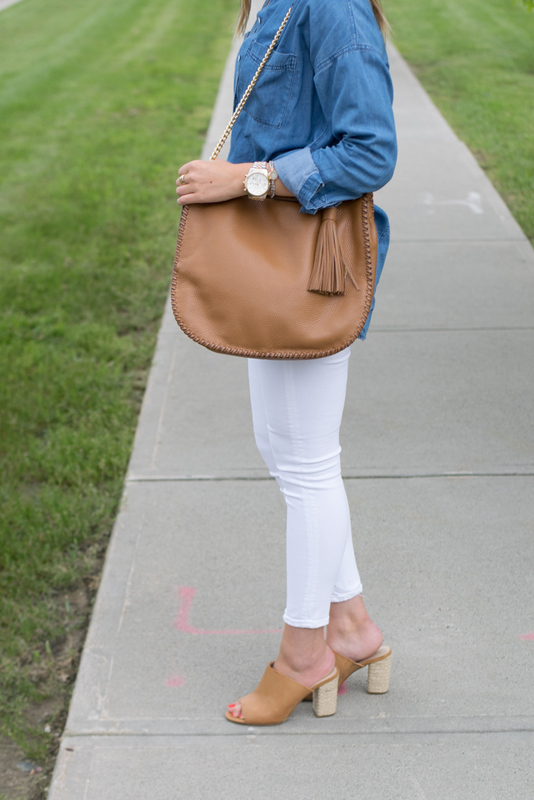 Chambray tops are my go-to, they go with everything and they can be dressed up or down so easily! I wish I could dress that casually at work sometimes! I'm living in a chambray button down, Tory Burch loafers and jeans on the weekend right now though! Can't wait for Fall! This outfit is so classic and I absolutely love it! 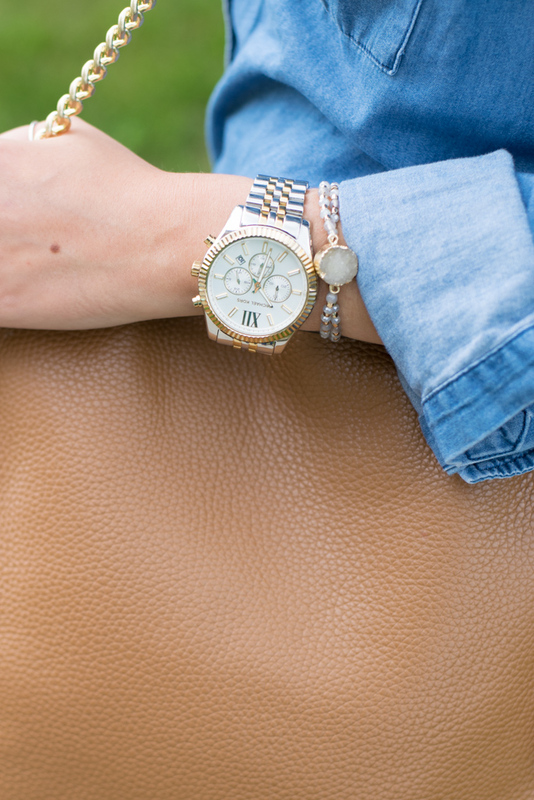 Chambray tops are always a staple! What a cute look!! 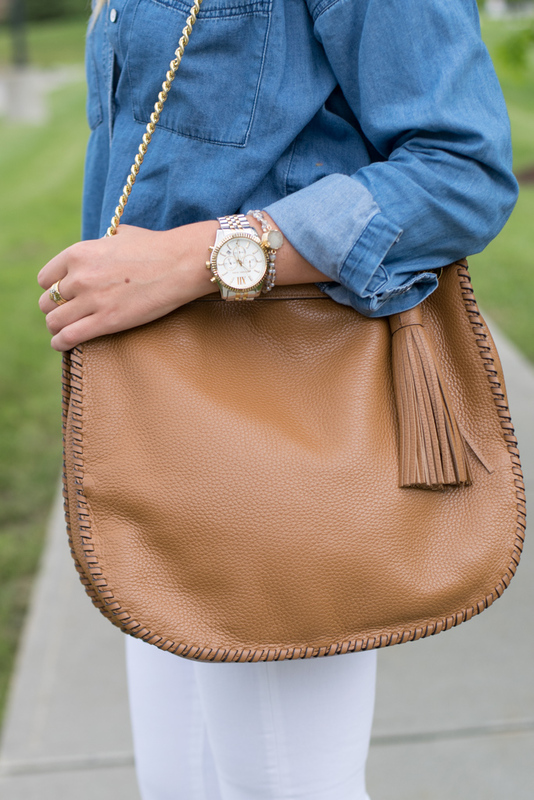 I love that bag, so cute and perfect for fall.